If you work online or with a lot of gadgets, chances are you want a backpack that can hold everything with an organized system for where things need to go. There are many backpacks out there that are only going for aesthetics, and look like they could only hold a laptop and a fun-size bag of M&Ms. If you are constantly on the move and need all of your gear to come with you, then you want something that looks professional and won’t make you worry about not having enough space for everything. 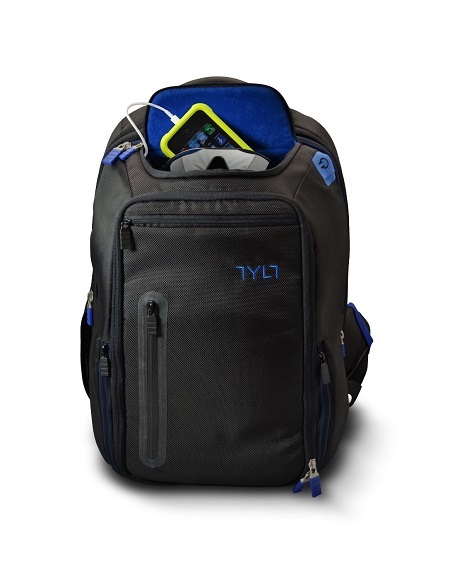 The Tylt Energy Backpack + Battery was made with the gadget-savvy in mind. You can charge three gadgets simultaneously thanks to the internal 10,500mAh lithium ion battery with in various configurations through the 7 pockets. That battery is capable of recharging your tablet once, and your phone four times over. You can even pass a cable outside of the backpack so you can charge your phone while it’s in your hand. If you can remember to keep the backpack recharged whenever you’re near a wall outlet, car charger, or computer, then this could regularly be a lifesaver. The material this pack is made from is a high-quality ballistic nylon, and most of the places to store your laptop, sunglasses, and phone are lined with a soft material that will keep them scratch-free. In the back panel, there is a trolley slot, meaning you can slide this over your rolling luggage when going through an airport. If all this isn’t enough, there’s a pass-through for headphones near the pocket meant for your phone, as well as a pocket for headphones on the backpack strap for easy access. This certainly seems worth the $200 ($140 if you have Amazon Prime) price tag.